I take great pride in the craftsmanship of my slings, and sew each one as though I would be using it myself. As such, I am confident that my slings will stand up ably to normal use. However, please examine the ring attachment each time you use the sling to insure that the stitching is secure. If it is not, you may send it back to me and I will refund your shipping costs, fix the sling at no charge, and return it to you, or refund your purchase price, as desired. Also keep in mind that with heavy use and frequent washing, nearly every fabric will break down with time. This should take many years with a sturdy fabric, but if you're using an older sling or one made with a delicate material, please look it over before using it. Any heavily worn spot may tear when stressed. Because all slings are custom-sewn to order, I cannot accept returns for reasons other than substantive defects in workmanship. If the color is not what you had expected, there are many babywearing swap groups available online, and on Facebook, one specific to SBP slings (search for SBP Sling Swap). I strongly encourage you to read through the relevant information on my site before purchasing to be sure your order will be what you're expecting. I know it's a lot to look at, but each section has some bullet points that will sum up the most important parts, and my email is info@sleepingbaby.net if you have questions about the color, shoulder style, etc. Before you use the sling for the first time, please be sure that you understand how, either by following my illustrated directions with a doll or other baby-sized item, or more ideally, by practicing with the help of an experienced sling-user. 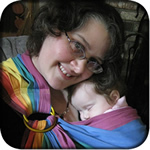 The Safe Babywearing page at The Babywearer has great tips. Please use good judgment and always put your baby's safety first. The sling is intended for babies and children under 35 pounds, although the rings, stitching, and material will hold far more weight. It is not intended to secure or restrain a child in a vehicle (always use a car seat!). Nor should it be used while the wearer is riding a bicycle, operating heavy machinery, participating in sports, or doing anything else that could cause harm to the child or cause the child to fall out of the carrier (as opposed to normal walking and other daily tasks). Always be aware of your child's position in the sling, and keep the fabric as snug as is comfortable; the looser it is, the less safe it may be. Do not use the sling near open flames or high heat, as the fabric is not fire-retardant or -resistant, and neither is your baby! Be aware of the sling tail position as well; with a longer tail, it is advisable to tuck the tail into the body of the sling, throw it over your shoulder, or wrap it around the rings, so that you do not trip over the tail or otherwise become entangled in it. Finally, as with other sling makers, I must disclaim all liability for any losses or injuries due to the use or misuse of this baby sling. Please use common sense and care while using your sling, and always make sure the fabric and stitching are in good condition before entrusting your child to them. If you have sent a ring sling to me to have the rings replaced or the shoulder re-sewn with overlapping pleats, please be aware that such surgery must necessarily result in a voiding of the original manufactuer's guarantees or warantees, as applicable, and that they should no longer be considered liable if the stitching that I did is found to be faulty. (I.e. if you buy a sling from a vendor and I remove her stitching and replace it with mine, if the stitching comes loose, then they should not be found at fault in any way.) If there are other problems with the fabric itself or stitching that I have not taken out or disturbed (i.e. if the hems are sewn poorly, or the fabric itself begins to tear), that may be a consideration for the original vendor, but please be aware that in having a sling disassembled (as for redoing the shoulder) the original vendor will likely disclaim all liabilities. (This would also be the case if the sling were bought second-hand, whether it is altered from its original form or not; guarantees/warantees on baby items are rarely transferrable unless it is explicitly stated otherwise.) However, I cannot take personal responsibility for tears in the fabric of a sling if it is not a fabric I would recommend; this is particularly true of thin cottons and the like; this is the buyer's own responsibility.